Celebrating Gaelic and Garlic Saints!! Making Our Mission!! 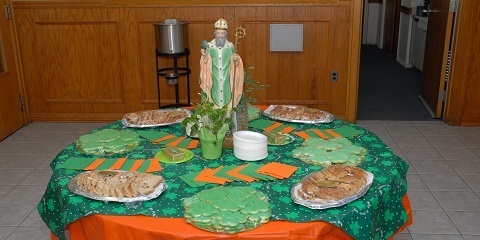 Dear Parishioners: We had some great celebrations at OLM last week. On Friday we had a large crowd for our Annual St. Patrick’s Day Mass. Sinead Campion did a brilliant job of reading in her native Irish, Fr. Dave Cavanagh delivered a terrific homily on the virtues of St. Patrick and Bishop Evans, an honorary Irishman, celebrated the solemn Mass. On Monday we celebrated St. Joseph with a beautiful Mass in Italian celebrated by Fr. Angelo Carusi. Dr. Anthony Bruzzese and Andrea Minopoli read terrifically in Italian. And the zeppoles and coffee were also delicious!! On Saturday night a couple of hundred good folks gathered for the Gaelic and Garlic Night. There was delicious corned beef, pasta and homemade meatballs! A large number of great gift baskets were raffled off and door prizes befitting the feast days were given away. We enjoyed Uncle Al the Accordionist serenading us with the Italian hit parade. The students of the Kelly School of Irish Dance put on a terrific show of Irish Step Dancing! And Shawn “The Irish Rebel” Reilly sang so well the many happy war songs and sad love songs of Ireland! We thank them for sharing their talent with our parish. We must truly thank Jamie Pedro, President of the OLM PTO and her many helpers for organizing such a great night. We thank the OLM Staff especially Dave Belanger, Sandra Demers, Doug Green and Mickey St. Jean who also worked to make the night a great success. These good folks and many others worked hard to make Gaelic and Garlic Night a terrific night for all! We wish to thank those who supported the event with their generous donations including Jamie Pedro and Kim Izzi who made 350 delicious meatballs!! We are most grateful to Tim Haxton of Haxton Liquors for donating all the liquor for our baskets and OLM Parishioner Paul Voigt of PJ’s Pub in Cranston who donated many of our raffle items. 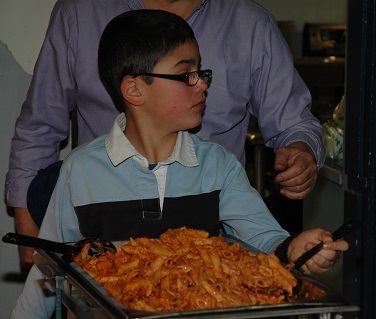 Also we are deeply grateful to OLM’s Andrea Minopoli of La Maseria Ristorante who supplied us with the delicious pasta for the night. And also OLM Parishioner Scott Nicchia of Boars Head Meats who donated all the corned beef and cheese for our sandwiches! 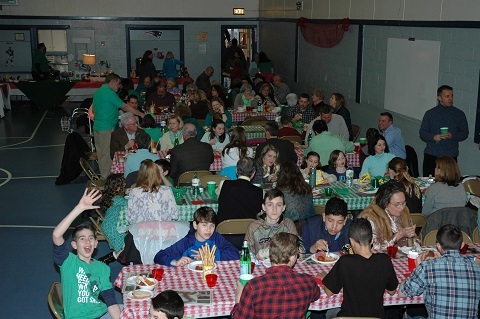 We thank the over 200 parishioners and guests who joined us at Gaelic and Garlic Night. They made a great night of great food, fun and fellowship. The proceeds from the night are going to the OLM Saints and Scholars Fund and we thank those who donated to support it. Truly a grand time was had by all! This weekend we welcome Fr. 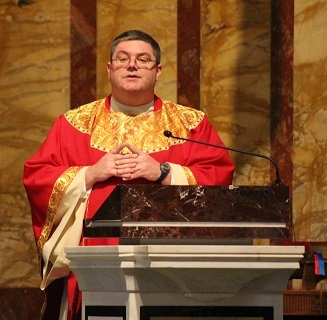 Chris O’Connor from the Archdiocese of Boston to OLM. He is the President of the Theological Institute for the New Evangelization, and the Vice-Rector of St. John’s Seminary. He was ordained in 1998 after studying at St. John’s Seminary and at the Gregorian University in Rome. He received a Licentiate in Philosophy from Catholic University of America in 2004 and a Licentiate in Sacred Theology from Boston College in 2010. Previously, Father served as director of the Pre-Theology Program and a professor of philosophy at St. John’s Seminary. He also served as the Associate Pastor at St. Mary Church in Chelmsford. He has organized seminary trips to Peru to visit with the Society of St. James and served as a member of the Archdiocese’s World Youth Day committee. He was director of the Archdiocese’s Youth Gospel Road Program from 2002-2007. In addition to his other duties Father O’Connor assists at weekend Masses at both St. John the Evangelist Parish in Winthrop and Sacred Heart Parish in East Boston. Father is a chaplain to the Missionaries of Charity and to the MCI Norfolk State Prison. He is currently working on completing his doctoral degree. Father O’Connor was most kind and generous in taking time out of his tremendously busy schedule to be with us and lead us on our Lenten Mission. I am so happy he kindly accepted the invitation to be with us and lead us on Mission. He is a well know and popular Mission preacher in the Boston area and in great demand. You will enjoy his insights into living our Catholic Faith more authentically in this 21st Century. Father is preaching at all Masses this weekend and each night at 7:00PM on Monday, Tuesday and Wednesday. Confessions are being heard each of those nights at 6:00PM with four priests. I encourage you to find the time and make the effort to come to the Mission to deepen your faith and devotion. See you at the Mission! Welcome to OLM, Fr. O’Connor! Be well. Do good. God Bless! Pray, Fast and Give Alms!